Thanks to you, 2012 was a success! • We started our organization! With volunteers spread throughout the country and internationally, we are proud to be a group of mostly teenagers who are making a difference in the lives of these amazing animals. • We began filming our documentary Voiceless. We’ve filmed interviews and shot on-location footage in Maine, Florida, etc. We’re stoked! • We took our Voiceless talks to our first- of many -classrooms! We were so thrilled to talk to our first class of fifth and sixth graders- they were so into it! The truth about captivity and the plight of cetaceans was something new to them- and they were totally inspired when they learned that they have the power to change it. • We were able to launch a campaign to raise awareness for the Disney Dolphins. Thanks to our Change.Org petition, our message has gone big with the public- urging Disney all the more to do the right thing by humanely releasing these four dolphins to seapens for rehab. • This November we launched our third Free Tilly Now campaign to support the humane release of Tilikum, the largest orca whale kept in captivity (captured in 1983). The word is getting out- and the support we’ve received is phenomenal. There’s absolutely no way we could have done all this without your support and financial help. Thank you for your comments of support and for helping us spread the word! 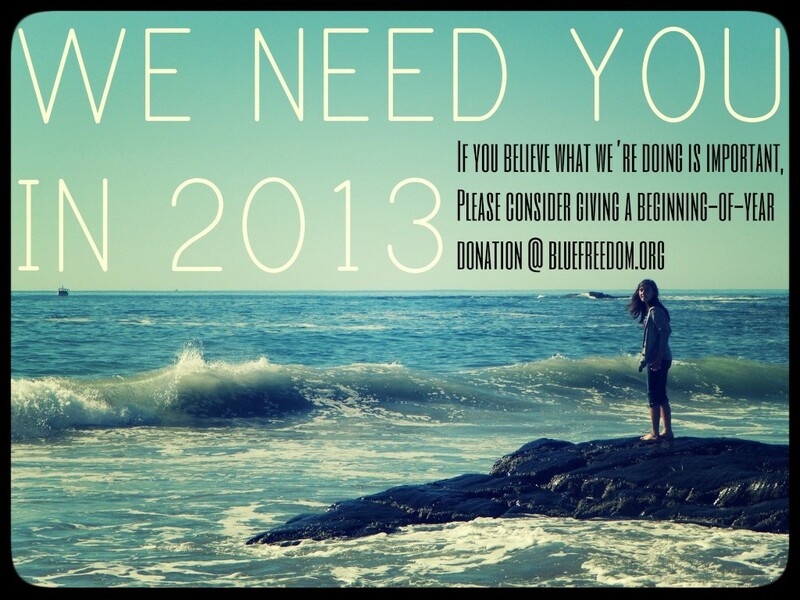 If you think this group is relevant and effective, I ask you to please consider giving a beginning-of-year donation to help us continue filming Voiceless in 2013. We’re looking forward to another exciting year of helping make this beautiful planet a more ethical place for cetaceans. 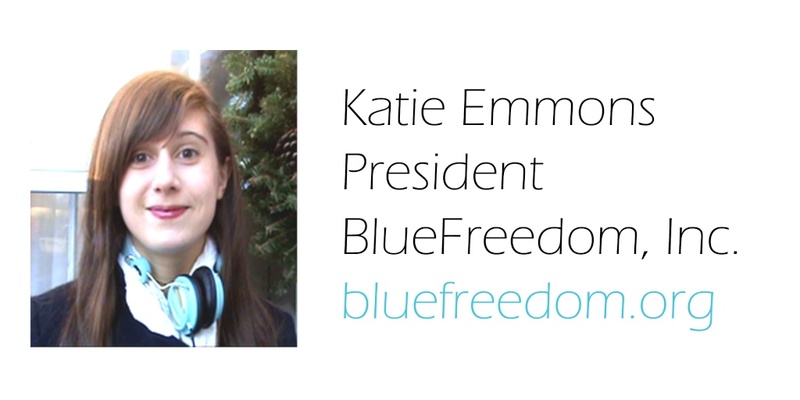 Congratulations Katie and everyone at Blue Freedom for all that you achieved in 2012. I believe your educational talks in schools will continue to be effective and successful—because kids will "get it." And when the kids don't want to go to captive marine mammal parks, the parents aren't going to spend hundreds of dollars to take them there. I applaud you and wish you great success in 2013. I think you’ll agree that this review of SeaWorld Orlando speaks to the reason why you are making a film called Voiceless. It was posted at TripAdvisor.com on February 8, 2013. “The Whale and Dolphin shows made me feel uncomfortable, if you look behind the stage you can see how small the pens are for the whales and also the dolphins, one whale looked distressed hitting its head against the barriers. When you consider one of the whales has been there around 25 years it's a little depressing, def not a place for animal lovers. The Dolphin pools are also very small. “Thank you for your email, I didn't realize how much this has affected me and I still feel a really deep sadness and will def look at the links. I will never go to a place like that again, and actually since I got home I have researched into it more and have been motivated to do more. There is an animal circus due to come by where I live in the near future and I have decided to assist any protest along with my daughter who was also upset.